This post is sponsored by FOREO, but the content and opinions will always be my own. Are you tired of all the toothbrushes out there? Well, I was! My next toothbrush had to be easy to use, tough on plaque, but still not irritate my sensitive gums. I was so excited to be offered a FOREO ISSA Hybrid to review for you. 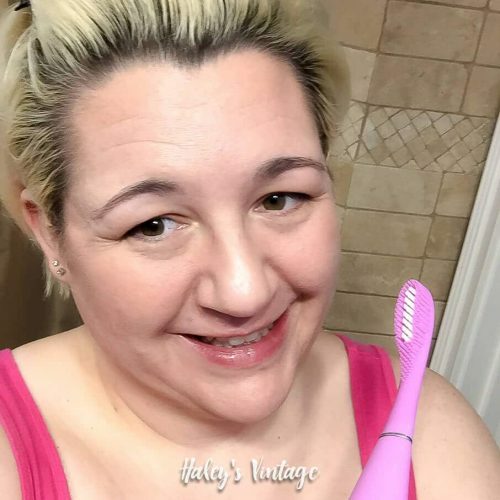 And during my FOREO ISSA Hybrid review, I was immediately surprised at how quick it surpassed all the other toothbrushes I have tired. And, trust me I take dental care very seriously! Keep on reading to see how FOREO ISSA Hybrid did with all my critical requirements! Okay, but this maybe a little too much info, but I have always struggled with plaque build up especially on the backs of my bottom four front teeth. Even though I have asked the dentist several times, and done tons of research, I have always had trouble finding a solution to this difficult problem. Affiliate links are used on Haley’s Vintage which means that I make a small commission when you make a purchase, at no cost to you. They only thing I can figure out is my body is just pre-dispositioned to build up plaque there, and ordinary manual toothbrushes will not remove this stubborn plaque. But thankfully, FOREO ISSA Hybrid seems to be making a dent on that build up! 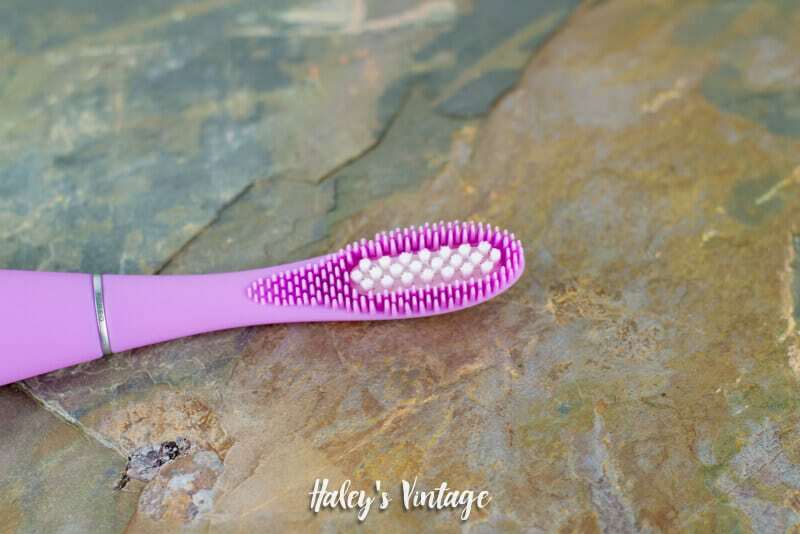 FOREO’s toothbrushes are ultra hygienic compared to your traditional nylon brushes. Theirs are made with silicone and PBT polymer bristles that not only provide fantastic cleaning abilities but also harbor fewer bacteria! After years of over-aggressive brushing with to firm of bristles, my gums have become sensitive. (I was trying to remove that dreaded plaque the WRONG way.) And, these soft silicone bristles provide a gentle massage on my gums and without irritating them. Plus, with FOREO ISSA Hybrid you can easily adjust the between the eight different speeds to find one that is most comfortable for you. As a mom of three, I am crazy busy! The last thing I need is something that takes a long time to charge. And, Foreo ISSA Hybrid surpassed my expectations again. In just a one hour charge you are ready to go for about 365 uses! And, Foreo ISSA Hybrid does not have a bulky cradle for you to store! With its USB style charger, all you need to do is lift that little flap in the back to charge your toothbrush. So simple! Since FOREO ISSA Hybrid is so hygienic, you only have to replace the brush head only one time a year! That will save you a ton compared to all the other quality electric toothbrushes out there. Just use code ISSABLOG17 and save 15% off your Foreo ISSA Hybrid purchase! Do you have any questions about my FOREO ISSA Hybrid review? What is the most important feature you consider when selecting dental care items? Don’t forget to share me to your favorite Pinterest board… Thanks!